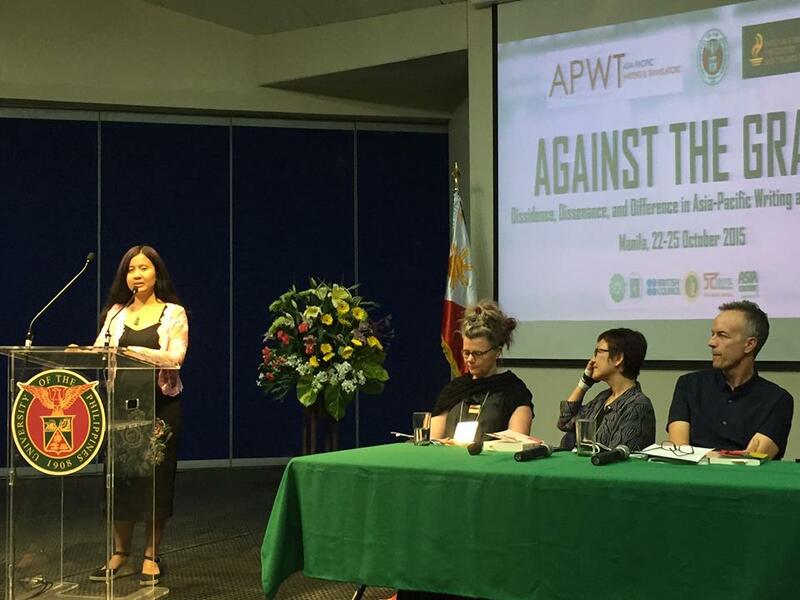 Launch of From Now On Everything Will Be Different at the Asia Pacific Writers & Translators Conference 2015 in Manila. With Beth Yahp and David Carlin. Moderated by Francesca Rendle-Short. Below are her notes. BETH YAHP is an award-winning author of fiction and creative non-fiction, including a novel, The Crocodile Fury, which was translated into several languages, and a memoir, Eat First, Talk Later. She wrote the libretto for the opera Moon Spirit Feasting, by composer Liza Lim, which won the APRA Award for Best Classical Composition in 2003. Born in Malaysia, Beth currently resides in Sydney, where she lectures in the Master of Creative Writing program at the University of Sydney. Eat First, Talk Later has just been released – I finished reading it on the plane here. This book is part memoir part biography (the story of her parents), part biography of a country, Malaysia. There is so much to learn here about this fascinating country – the place, the food, songs, tradition, religion, as well as the social and political forces at play – corruption, race riots, historical facts and narratives. There is so much to learn here about writing, the choices writers make, the difficult decisions and how to get started. As Beth says in the book, this could be read as a love story, a simple love story between a boy and a girl set in a kind of “second golden age, a blossoming between war and the Communist Emergency – when things are freer and the future seems bright”: the Malaysian Spring. It’s also a simple anti-love story about revisiting a country the narrator loves and loathes, a place that has never loved her. It is a story of recovery, a making-do story. DAVID CARLIN is the author The Abyssinian Contortionist published by UWA Publishing this year. His other books include the widely acclaimed memoir Our Father Who Wasn’t There and Performing Digital. Apart from books and essays, he has also written and directed plays and films, and co-devised a mixed media exhibition for the 2014 Melbourne Festival. He lives in Melbourne, and is co-director of the nonfictionLab research group as well as WrICE (the Writers Immersion and Cultural Exchange program). David is co-chairing, with Robin Hemley and Nicole Walker, the 2015 NonfictioNOW Conference in Flagstaff, Arizona that happens next week. This is a book that is part biography, part memoir, a tender portrait of both Sosina and David himself, a story that is negotiated on the page word by word, sentence by sentence. Some reviewers have called it an immersive style of narrative nonfiction where the author, David, writes with “rare honesty and bald self-doubt.” The book was written over several years, across different countries – Australia and Ethiopia – and strikes a delicate balance between giving the reader story of Sosina and her circus Gamo Circus School of Ethiopia, while at the same time, reminding the reader that the narrator, David, is ever present, trying to make sense of what is going on. ELIZA VITRI HANDAYANI is an author and a literary translator. Her novella From Now On Everything Will Be Different was published in Indonesia in 2014, and has now been published in English by Vagabond. Her works have also appeared in leading Indonesian outlets, as well as in the Asia Literary Review and Griffith Review: New Asia Now. She is also the founder of InterSastra, an Indonesian literary translation initiative. From Now On Everything Will Be Different takes its name from a photographic exhibition that sits at the heart of this book. This is the story of a younger Indonesian generation asking themselves: what does it mean to be free? There is Rizky surrounded by the comforts of a middle-class upbringing, and Julita a photojournalist who documents the protests and upheaval as democratic reform sweeps across Indonesia in the late nineties during the age of Reformasi. I agree wholeheartedly. It was a great read. It taught me so much as an Australian about one of our nearest neighbours.